If you have inactive clients and would like to delete them, which will remove all record of them, you can do so by going to the client card, click Edit in the Details section and on the right side panel click Delete. Alternatively, if you would like to keep a record of your inactive clients, you can do so by using the Client Categories feature. Creating an Inactive Clients category. 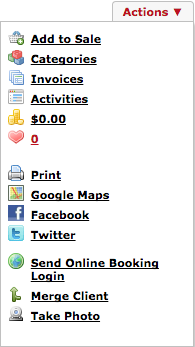 Go to Admin, into the Lists tab, drop down the Select Lists menu and pick Client Categories. Click New to create your Inactive Clients category. On the right side panel give it the name, and Save. Note: Don't tick Add to new clients. Now that you have created your Inactive Clients category, you can assign inactive clients to the category. Assigning clients to the Inactive Clients category. Search for a client who you would like to make inactive, click their name in the Search Results. Once in their client card, in the Actions menu click Categories. Tick the Inactive Clients category, then Save. Disable the inactive clients from SMSs and email. While you're in their client card, it is important to disable them for all SMSs and email. Click Edit in the Details section of their client card. 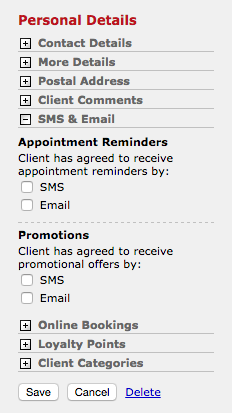 On the right side panel un-tick SMS and Email forAppointment Reminders and Promotions, then click Save. Bringing up a list of inactive clients. This will display a list of all of your clients. Now use the Category filter to bring up a list of only your Inactive Clients. Your Inactive Clients will be displayed. From here you can print and export the list, or even send the inactive clients an SMS or email if ever you need to.